Matthew Soerens is US Director of Church Mobilization at World Relief and co-author, along with Stephen Bauman and Issam Smeir, of Seeking Refuge: On the Shores of the Global Refugee Crisis. As of the end of 2015, the United Nations High Commissioner for Refugees estimates that 21.3 million people throughout the world met the definition of a refugee, having fled their country because of a well-founded fear of persecution on account of their race, religion, political opinion, national origin, or social group. That number is larger than at any other time in recorded history—and it does not include more than forty million others who have fled their homes because of persecution or violence but have not crossed an international border. Faced with such unprecedented human upheaval, the question arises: what does it mean to uphold public justice for refugees? What does a “just welcome” look like? 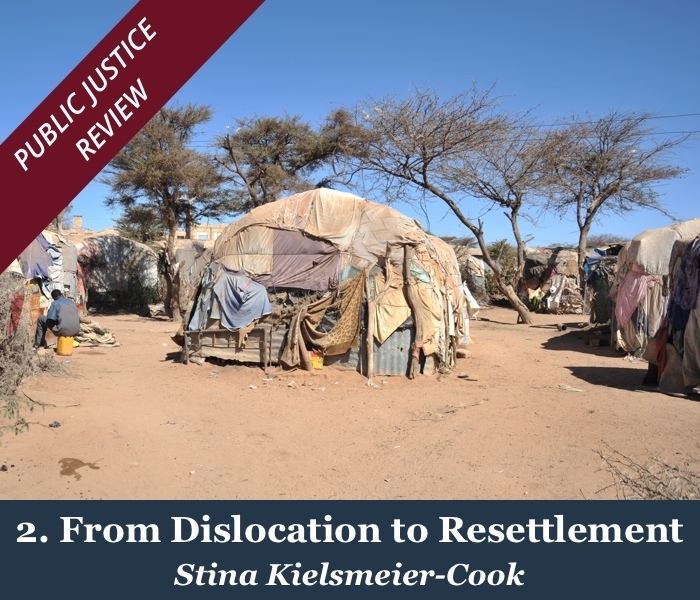 This issue of Public Justice Review includes several unique perspectives on how governments, institutions, churches, and citizens can and should work together to support the human flourishing of these most vulnerable people. In the United States, at least, governmental response to this crisis has shifted dramatically with the installation of a new presidential administration. The previous administration had raised the maximum number or refugees to be admitted and resettled in the United States to 85,000 in Fiscal Year 2016 and then, as part of a diplomatic effort to encourage other countries to redouble their commitments to caring for and resettling refugees, to 110,000 in FY 2017. (By comparison, this “refugee ceiling” was set between 70,000 and 80,000 throughout the George W. Bush administration and the first six years of the Obama administration; in 1980, the year Congress passed the Refugee Act authorizing the president to set the maximum number of refugee admissions, the ceiling was set by President Carter at 231,700). After winning a presidential election in which refugee resettlement—particularly of Syrian refugees—had become a central campaign issue, President Donald Trump issued an executive order just one week after his inauguration that made a number of dramatic changes to US refugee policy. When many of these policies were quickly subjected to a temporary restraining order by a federal judge, the president revoked the initial order and issued a revised order, triggering a new round of judicial review. However, one element of both executive orders that was not challenged was the president’s reduction in the maximum number of refugees to be allowed in FY 2017 down to 50,000, the lowest level since the passage of the 1980 Refugee Act. Given that more than 30,000 refugees had already been admitted in FY 2017 prior to President Trump’s inauguration, this new policy would mean that fewer than 20,000 refugees would be admitted during the remaining eight months. As has been the case with many of the actions of the new Trump Administration, public opinion in response to this refugee-related executive order has been polarized. The Pew Research Center found that, while about six-in-ten of all Americans disapproved of the order, most white Protestant Christians—including a remarkable 76 percent of white evangelicals—supported these policy changes. However, while evangelicalism has often been defined (at least in part) by “a high regard for and obedience to the Bible as the ultimate authority,” the Scriptures do not seem to be what is most influencing evangelical views on the topic of immigration and refugees: a 2015 LifeWay Research survey found that just 12 percent of evangelical Christians cited the Bible as the primary influence on their views toward immigrants, significantly less than the 16 percent who cited “the media.” While refugees resettled to the United States are a small subset of all immigrants—distinguished from others both in their possession of legal status from their arrival and by the persecution that, by definition, was the primary factor in their decision to leave their home country—I suspect that relatively few evangelical Christians have thought much about the specific application of the Bible to refugee issues, either. That is not because the Scriptures are silent on the matter. In fact, the Bible speaks repeatedly and clearly both to immigration issues generally and to refugees specifically, with 92 references to the ger (translated variously in English as the stranger, sojourner, foreigner, resident alien, or immigrant) in the Hebrew Scriptures alone, frequently mentioned alongside the orphan and widow as uniquely vulnerable people worthy of particular concern. 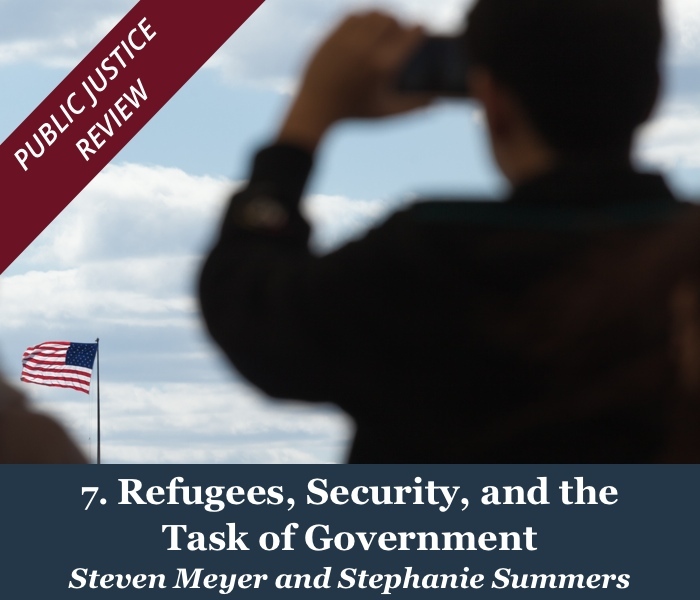 This issue of Public Justice Review focuses specifically on refugees, and foundational to the Christian concern for refugees is the belief that, like all other human beings, refugees are made in the image of God and thus possess inherent dignity and potential. Refugees would be included in the command to love one’s neighbor (Lev. 19:18, Luke 10:27). In his parable responding to a legal scholar’s request for a more precise definition of “neighbor,” Jesus makes clear that our neighbor cannot be defined narrowly to include only those who share our ethnicity or religion, but is to be defined broadly. Furthermore, Christ’s example of a good neighbor—the Good Samaritan who cares for a (presumably) Jewish man who has been beaten, robbed, and left to die alongside the road to Jericho—demonstrates love and compassion even when it means subjecting himself to risk (stopping along an apparently dangerous road) and to financial costs (to pay an innkeeper to look after the beaten man until he recovers). Notably, Jesus himself was also a refugee. Though our nativity pageants tend to conclude with the Magi bowing before the Christ child and presenting their gifts, the gospel of Matthew does not stop the story there; as soon as the Magi exit the scene, Joseph is warned in a dream that the paranoid King Herod is set upon murdering all of the young boys in Bethlehem, and so Joseph obediently wakes Mary and Jesus in the middle of the night and they flee their homeland to seek refuge in Egypt (Matt. 2:13-14). The text does not tell us how the Holy Family was received in Egypt—whether with welcome or scorn, compassion or suspicion—but it is interesting to speculate, if only to compel Christians today to ask if the ways that we treat refugees arriving in our country are consistent with how we would want our Lord and Savior to be treated when he arrived as a child refugee in a foreign land. Many of those who arrive as refugees in the United States actually are followers of Jesus. In fact, over the past decade, there have been significantly more Christians (of various Christian traditions) admitted to the United State as refugees than those of any other religion. Many were persecuted particularly for their Christian faith. Paul writes that the suffering of one part of the Body of Christ should be felt by all parts (1 Cor. 12:26), so North American Christians should have a particular concern for the wellbeing of brothers and sisters in Christ who have fled persecution. When we welcome “the least of these,” we actually welcome Christ himself (Matt. 25:40). Many other refugees admitted to the United States in recent years, however, are not Christians. Many North American Christians see the arrival of Muslim refugees—who comprised 46 percent of the refugees admitted to the United States in FY 2016—as a particular threat. Others, though, see their arrival as a unique opportunity. As people who in many cases would be very unlikely to encounter the message of the gospel in their country of origin, these refugees have multiple opportunities in the United States, with its constitutionally protected religious freedom, to either accept or reject the Christian message, without coercion. Many missiologists believe that God is working to fulfill his mission through the migration of people across borders, and that God has foreordained a purpose in these movements of people: that those who might otherwise never have encountered him “would seek him and perhaps reach out for him and find him” (Acts 17:27). The biblical case that Christians should extend welcome, compassion, and love to refugees is quite clear. But the Bible does not provide a blueprint for US (or any other country’s) refugee policy—the ways that Christians exercise their faith by advocating for or against particular policies will inherently require some prudential determinations. 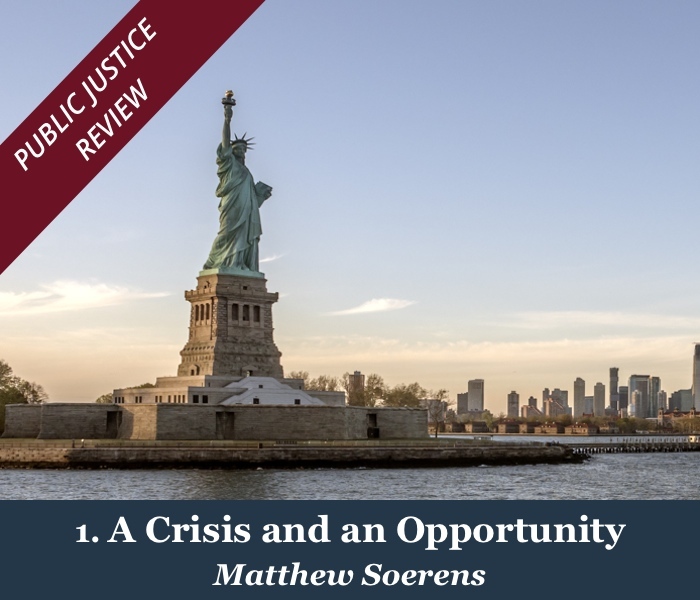 The articles that follow in this issue of Public Justice Review can help to inform those determinations, particularly in light of the dramatic changes enacted by President Trump in his first days in office. CPJ’s Chelsea Langston Bombino, for example, highlights the religious freedom dynamics at stake with the stark reduction in refugee arrivals. With very few refugees (relative to recent history) allowed to enter the United States for the rest of the fiscal year (at least), the ability of local churches and faith-based organizations to practice their faith by welcoming refugees is also dramatically curtailed. In Canada, by contrast, the number of refugees arriving has significantly increased over the past year. 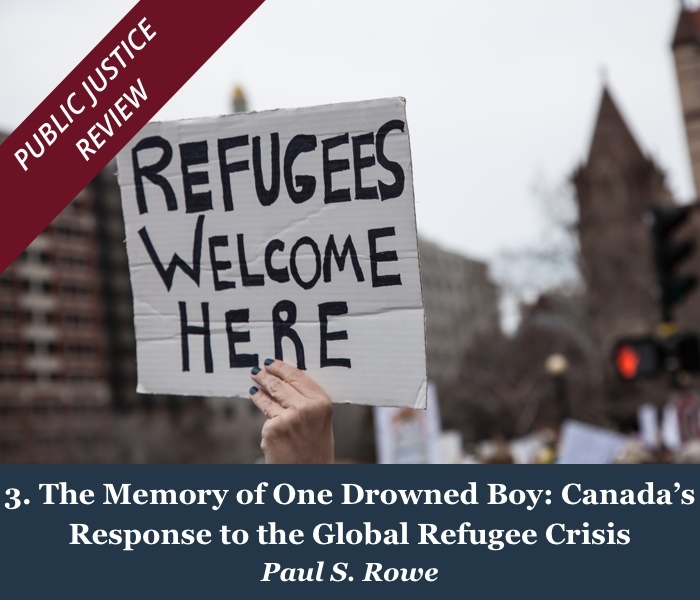 Political scientist Paul Rowe of Trinity Western University in British Columbia examines how the political headwinds have shaped policy in Canada in ways starkly different than in the United States. 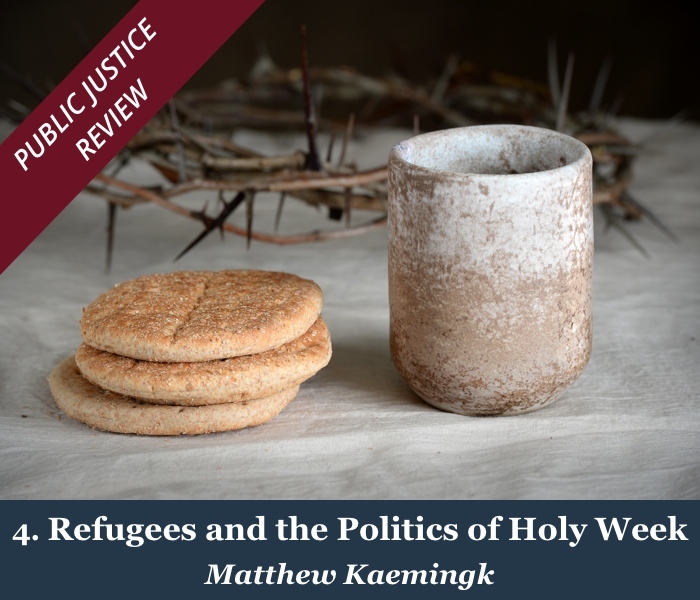 Theologian Matthew Kaemingk provides a timely exploration of how the liturgical season of Holy Week, when we remember the week leading up to Christ’s death and resurrection, ought to inform our response to the refugee crisis. And while our views on public policy questions must certainly be grounded in facts, they also can be informed by relationships. 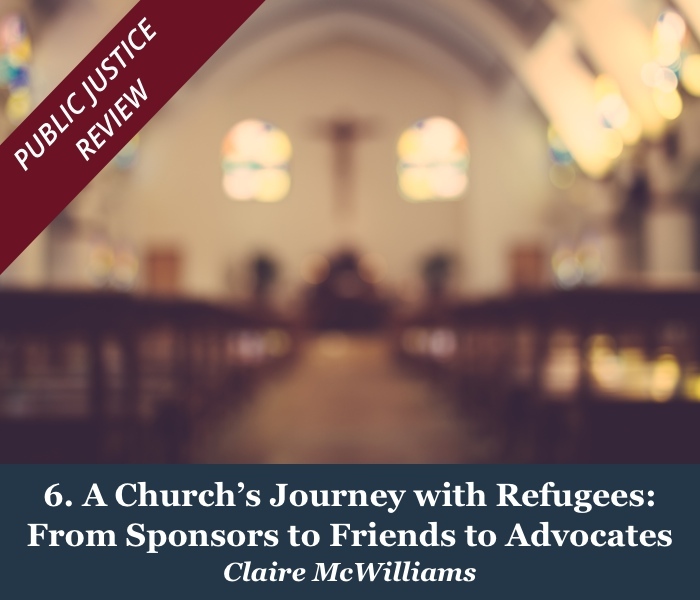 Claire McWilliams, an elder at Loop Christian Reformed Church in Chicago, tells the story of how her local church befriended a particular Syrian refugee family, and the ways that this friendship has shaped her views of public policy. 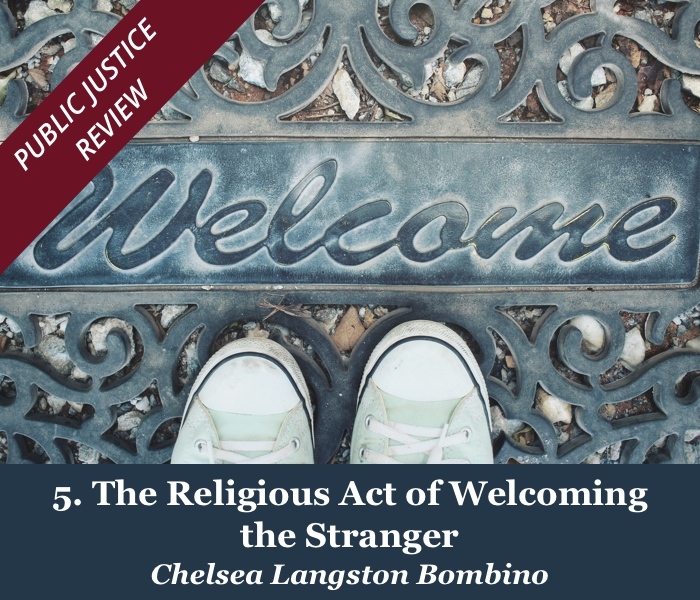 Ultimately, our views and our practice of what a just welcome looks like—and how public policy ought to facilitate it—will be informed by a combination of the facts, our faith, and the personal interactions we have with refugees themselves. The federal Fiscal Year lasts from October 1 through September 30, so FY 16 began on October 1, 2015. The reduction in total refugee admissions was not challenged by the State of Washington’s lawsuit that led to the first executive order being held on a temporary basis; others have challenged even this element of the executive order in court but—as of this writing—not successfully. To respond to the author of this article please email: PJR@cpjustice.org. Public Justice Review (PJR) explores in depth specific questions of public justice, equipping citizens to pursue God's good purpose for our political community. Articles do not necessarily represent an official position of the Center for Public Justice but are intended to help advance discussion. Articles, with attribution, may be republished according to our publishing guidelines. What Is Public Justice Review? Public Justice Review (PJR) explores in depth specific questions of public justice, equipping citizens to pursue God's good purpose for our political community.